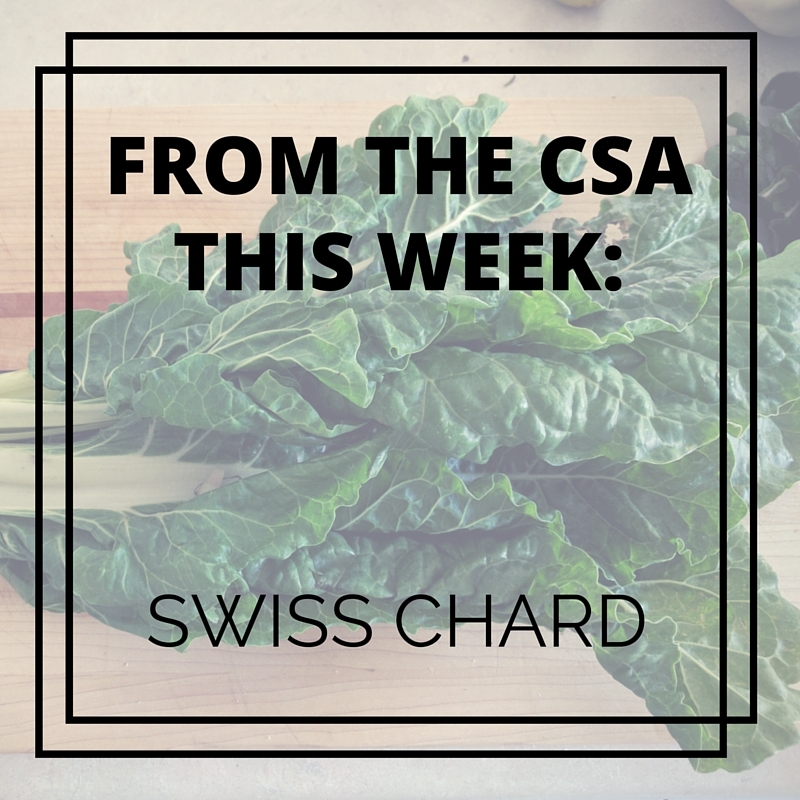 If you haven't guessed yet, Swiss chard grows *really* well here. We have gotten it two weeks in a row in our CSA shares. 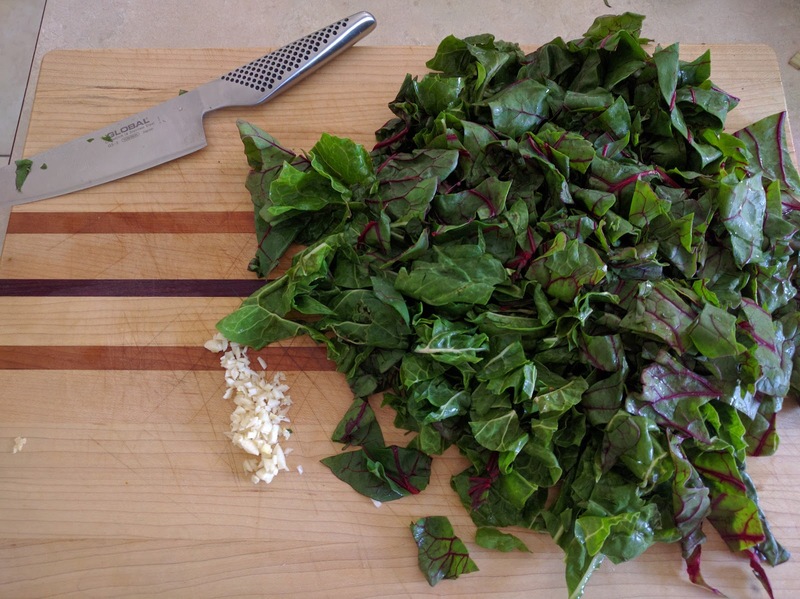 While it's not hard to use in recipes (you can use it any recipe that calls for cooked spinach), it comes in such large bunches that the sheer quantity of greens to be used can be overwhelming. 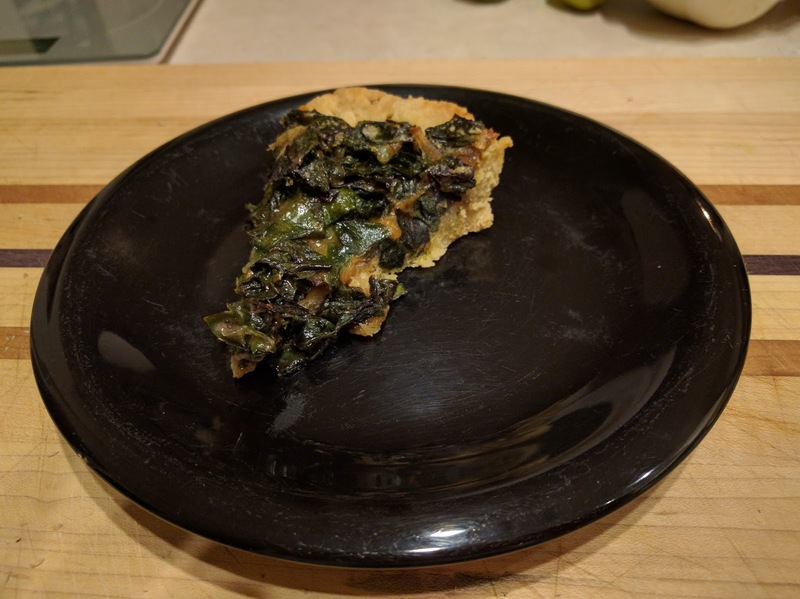 I used last week's bunch in a lentil and chorizo stew and this week's got made into a swiss chard tart. This recipe, just like last week's CSA share recipe, comes from The Joy of Cooking (1997 edition). While I'm great at pie crusts, I'd never made a tart crust before, as called for in this recipe and didn't have a proper tart pan. I used a 10" pie plate and while my crust was a bit heavy and uneven, there was plenty of room for filling and I was able to serve the slices out of the pan without any trouble. Swiss chard can sometimes have a bit of a bitter taste even after it's been cooked but the egg and Parmesan in this recipe covered any residual sharpness in the chard. 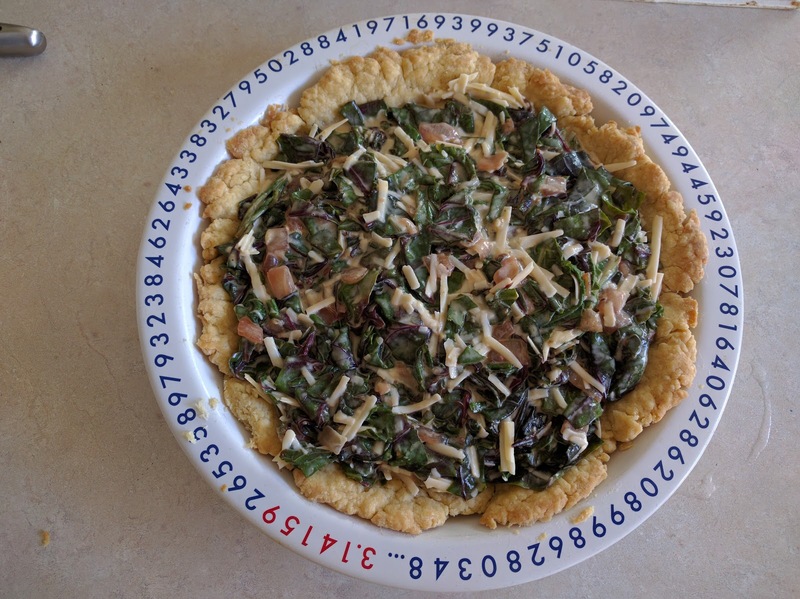 And while this recipe does include eggs and cream, it's not a quiche or fritata and the main ingredient is still the Swiss chard, so it's still relatively healthy. This tart is excellent for accompanying a summer meal or a vegetable soup or with grilled or smoked meat (we served it with a smoked pork tenderloin). Preheat the oven to 425 degrees and place a rack in the lower third of the oven. Mix flour and salt together in a medium bowl and then stir in olive oil and milk. The dough will be crumbly and difficult to roll so press it into pan, aiming for an even thickness. Prick the bottom several times with a fork and bake for 10-15 minutes, until the tart is light golden and set. While the tart is backing, sautee the onion in the olive oil until softened and golden, then add the chard and garlic. 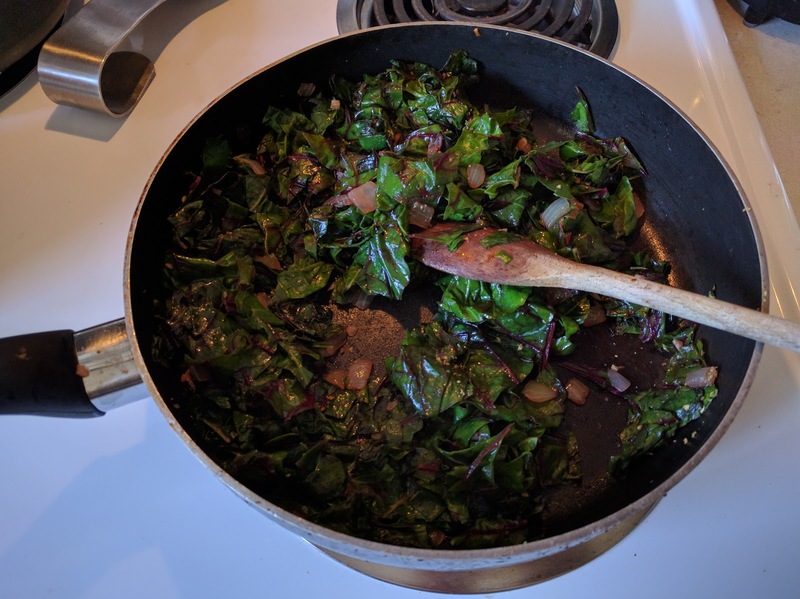 Cook, stirring often, until the chard is wilted, about 10 minutes. Remove from heat and season with basil, salt, and pepper. In a separate bowl, combine eggs, cream, and Parmesan cheese and mix well, then add the chard mixture. Stir until well-combined then scrape mixture into tart shell. Reduce oven temperature to 375 degrees and bake until the filling is golden brown and firm, about 35 minutes. Serve warm or at room temperature.